USS Colorado entered service upon her commission in August 1923. After a kickoff voyage to Europe, the ship reported to the Pacific in 1924. That was her home for much of the rest of her life. She took part in various operations designed to maintain naval combat readiness for the next couple of decades. She was part of the naval visit to New Zealand and Australia in 1925. She also participated in the search for Amelia Earhart in 1937. 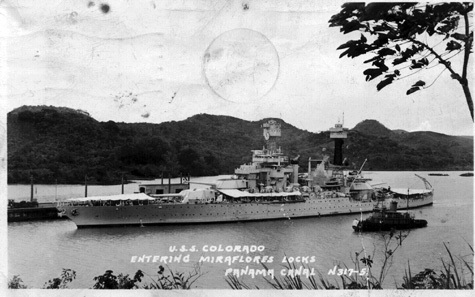 Due to a scheduled overhaul, USS Colorado missed the attack on Pearl Harbor. With her overhaul complete, USS Colorado patrolled the West Coast in 1942. Later that year, she reported for duty at Pearl Harbor. For the next few months, her job was to deter any further Japanese offensive actions while forces at home prepared. Beginning late in 1943, the ship participated in the invasions of Tarawa, Kwajalein, Eniwetok, the Marianas, and Tinian. USS Colorado sustained casualties at Tinian when enemy fire hit the top deck. In November 1944, she was part of the force at Leyte. During that time, two kamikaze planes hit her. However, she continued operations with action at Mindoro, Lingayen Gulf, and Okinawa. Once the war ended, the Navy decommissioned her in January 1947 and sold her for scrap in 1959.